Glen Nelson Center is a shared workplace for all Minnesota Public Radio and American Public Media employees. 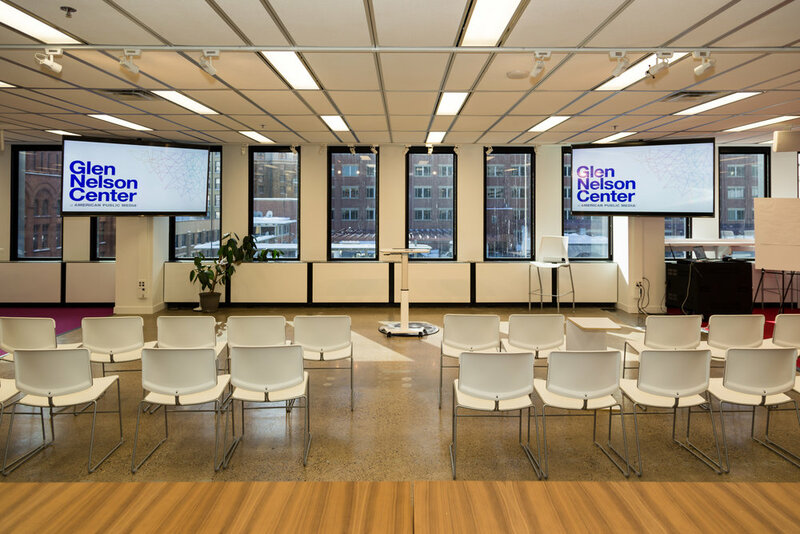 At Glen Nelson Center, you will find a variety of amenities including better-than-average coffee, powerful wifi, open production studios, a “pitch” event space and even (one floor down) ping-pong and foosball. You will also find a community of creators working to ignite public media through entrepreneurship. Glen Nelson Center is located on the 5th floor of Osborn370, three blocks from the Kling Public Media Center in downtown St. Paul. You can get to the Center by walking through the skyway or down Wabasha or Cedar Streets. The Osborn370 main lobby is open from 8:00 a.m. and 5:00 p.m. Monday-Friday. Check in at the first floor security desk using the iPad / Envoy system. The 5th floor doors to Glen Nelson Center are open during business hours. After hours access can be arranged — please contact Rose or Theon. You can work throughout Glen Nelson Center (5th floor) and Community Floor (4th floor). There are a variety of tables, desks, and informal meeting areas. APMG wifi is available throughout Glen Nelson Center and will work with your work-issued laptop. There is also a Glen Nelson Center guest wireless network. Login and password information is posted throughout the space. There are several conference rooms available for staff use at Glen Nelson Center and the Osborn370 community floor. We will have a system for booking conference rooms up and running soon. Book Glen Nelson Center conference rooms on Roomzilla. There is an informal event space available for meetings and events from 20 to 120 people. The event space is available, free of charge, to APM staff for daytime events. The event space is also available for evening, weekend, and external events at reasonable rates. Please contact Rose Martin‍ or Theon Masters‍ to explore hosting staff or external events at Glen Nelson Center. Glen Nelson Center has two production rooms designed for audio and small-scale photography/video projects. Studio G (Listening/Production) is designed for critical listening and viewing of content as well as content production. Studio BB (Black Box) is an open space designed for creative exploration of audio, photography and video projects. Both spaces are available to APM staff for creative experimentation. You do not need to be working on an APM project to use these spaces. Book studio spaces on Roomzilla. If you wish to use our audio recording equipment, please contact Rose Martin or Theon Masters. The 4th floor of Osborn370 is a community floor designed for the use of all tenants, including MPR and APM staff. The Community Floor features a large kitchen, several lounge spaces, a game room with foosball and ping-pong and a reservable board room and large training room. Please feel free to use the community floor during regular business hours. We strive to create a welcoming, safe, respectful and inclusive work environment. To that end, inappropriate behavior will not be tolerated. Please respect the space, cleaning up after yourself, and always leave a space (desk, conference room, kitchen) better than you found it. Practical tips: If you’d like coffee, make a pot! If you dirty a dish, put it in the dishwasher. If the dishwasher is full, please empty it.